Between January and July of 2017, we set out to tell the story of transportation on Corrine Drive in several ways. We collected traffic data, public opinion, and historical information. We used mechanical devices, anecdotal observations, photos, and video. Our efforts produced a variety of media that use this information to describe different parts of that story. Here are some suggestions on how you can take in the large amount of information from Phase 1 of the Corrine Drive Complete Streets Study. Even if you don’t have much time for digesting study information, we have three pieces that quickly give you an idea of what the first phase of the study was all about and prepare you for what’s coming. 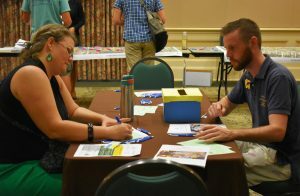 You can get a basic introduction from the MetroPlan Orlando Corrine Drive Public Workshop video, which debuted July 27. This 6-minute presentation brings together some technical information about the road and neighborhoods, outlines the purpose of the study and uses comments from people involved in the life of the corridor. It served as an introduction for participants at our July 27 Public Workshop. If you attended the workshop, you probably saw this video, but you might like to review it. If you didn’t make it to the workshop, this will give you the flavor of what we’re doing. The Existing Conditions Report is another way to get an overview of the first phase of the study. This 14-page report includes information on all aspects of transportation on Corrine Drive — from travel patterns and conditions to health concerns and parking. Throughout the report, we’ve highlighted Fast Facts and Best Practices to better acquaint you with the language and aims of the study. For a look at how people who use Corrine Drive feel about it, check out the Corrine Drive Study Survey Report. It distills the data we received from 1,705 community survey responses into 20-pages with charts and pull-out quotations to summarize the main takeaways. We’ve arranged ideas for improving the corridor from the most popular to least popular, so you can see how that compares with your #CorrineWishList. If you prefer to get your information in visual form, you can browse through the illustrations that summarize much of the data we shared with participants on July 27. The three documents below relate to three stations set up at the Public Workshop: 1) Results from #CorrineWishList public survey; 2) Traffic data and important demographic facts about the study area; 3) Statistics about health in the Corrine corridor. We also have a gallery of photos from our Public Workshop, so you can see how the event was organized. And we have a gallery of photos from some of our Phase 1 community outreach events. Because of the volume of data in Phase 1, we can provide some very specific information about the Corrine Drive study area. Here are some documents you can peruse if you’re willing to spend a little more time. The documents below give detailed information about the characteristics of the study area, the health profile of the area, an analysis of current and future traffic operations, and a detailed map of where and how we collected traffic data in Phase 1. No matter how you decide to consume this information, feel free to contact us if you have questions. And don’t forget to sign up for our study newsletter here.